These tables can be sorted, filtered, searched, shared, and exported to various formats. Certain columns have links which open maps or other documents. Click the text in that column to open the document. The link column will be specified above the table. Options to export the table can be found at the “MENU” button at the top-right of the table. Click “MENU”, then “Download”, then choose from the “Download As” list. You may view the table in a new tab or window by clicking the table name next to the search and information icons at the top-left of the table under the “data.Hawaii.gov” header; or you may click the full screen icon at the top-right of the table under the “MENU” button. 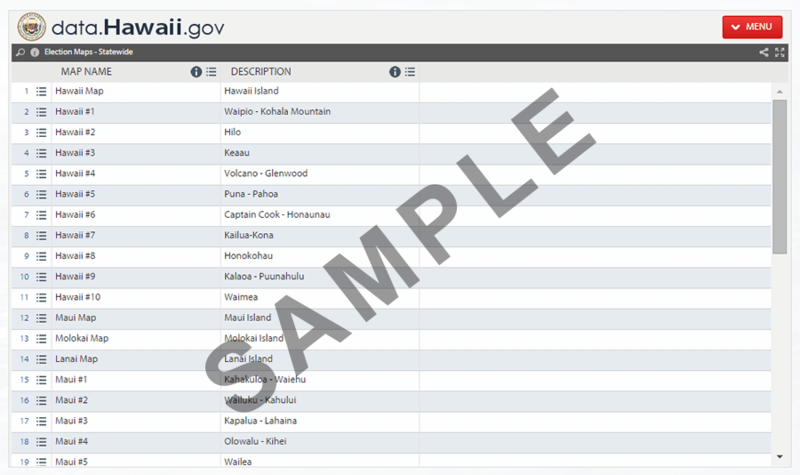 The table will be displayed at an external web site: data.hawaii.gov. After opening the table in a new window, you may return to the original page by closing the tab or window, or you may navigate back by using your browser tabs or desktop controls. For additional information, view the video guides (at the data.hawaii.gov site). In the left column, click the “Consumer” link to only show videos related to viewing data.